Three more bus routes are to switch from Dublin Bus to Go-Ahead Ireland from Sunday October 21st, in a move that will see improved services, not just on these routes, but in other parts of the network too. Passengers on these routes will see immediate improvements in frequency and service levels from Sunday, and on 17 other routes being transferred to Go-Ahead Ireland in the weeks and months ahead. In addition, the switchover of routes will free up resources which has allowed the NTA to approve a major programme of service enhancements, including significant frequency improvements on 5 Dublin Bus routes from Sunday. 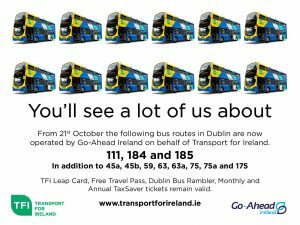 This follows the October 7th switch from Dublin Bus to Go-Ahead Ireland of routes 45a, 59, 63 and 75, and the improvement of services on Dublin Bus Route 14. On Mondays to Saturdays there are earlier trips from Dun Laoghaire towards Brides Glen to allow for better connections to the Luas green line. A brand new Sunday service is being introduced to offer an hourly frequency, with the first journey from Brides Glen leaving at 09:33 and the final journey leaving at 23:33. Departure times between Dun Laoghaire and Dalkey and vice versa have been coordinated with service 59 where possible to offer more evenly spaced departures along these roads. The route stays the same and there are no route variations. The timetable has been designed to connect with revised DART services at Greystones to and from Newtownmountkennedy. The first and last journeys are broadly similar but the Monday to Friday evening frequency has increased to every 30 minutes. On Saturdays and Sundays, there will be extra journeys operating every 30 minutes, compared to current service provision of every hour on Saturdays and 2 hours on Sundays. The route is not changing but more journeys are also serving the Palermo Estate. All roads on the 185 route will be continued to be served. Some improvements have been made to make the timetable easier to understand. There will be departures every 30 minutes from Bray DART station to Palermo Estate, with one of these continuing every hour to Powerscourt via Enniskerry. The 185 will continue to terminate at bus stop 4108 which is Enniskerry Golf Club (known locally as Shop River). The switchover of routes frees up resources in Dublin Bus which has allowed the NTA to approve a major expansion programme including significant frequency improvements on 25 separate Dublin Bus routes. These improvements will help meet increased demand at peak periods and will encourage greater use of bus services during the off peak period and on Saturdays and Sundays. Frequency improvements will be introduced on a phased basis as driver and vehicle resources become available. Monday to Friday, morning peak services to operate from both Santry and Sandymount with an improved 10-minute frequency. Daytime frequency will improve from every 20 minutes to every 15 minutes and evening frequency from every 30 minutes to every 20 minutes. Saturday services will commence an hour earlier at 0700. There will be 20-minute frequency from 0900 throughout the day to the last bus. On Sunday, services will commence an hour earlier at 0900. Monday to Friday, evening frequency improved from every 20 minutes to every 15 minutes. Saturday, evening frequency improved from every 20 minutes to every 15 minutes. Sunday, daytime frequency improved from every 20 minutes to every 15 minutes and evening frequency doubled to every 15 minutes. Services to commence earlier from Limekiln Avenue at 0815 on Sundays. Services to commence earlier from Stocking Avenue at 0600, Monday to Friday. Daytime frequency to be improved from every 20 minutes to every 15 minutes. On Saturdays, early morning frequency doubled from every 30 minutes to every 15 minutes. Daytime frequency on Saturday will improve from every 20 minutes to every 15 minutes, with evening frequency increasing from every 30 minutes to every 20 minutes. Sunday daytime frequency will improve from every 30 minutes to every 20 minutes. Daytime frequency Monday to Friday will improve from every 15 minutes to every 10 minutes, with evening frequency improving from every 30 minutes to every 20 minutes. Daytime frequency on Saturday will improve from every 15 minutes to every 10 minutes, with evening frequency improving from every 30 minutes to every 20 minutes. Sunday services will commence earlier at 0800 from Clarehall and Jobstown and daytime frequency will improve from every 20 minutes to every 15 minutes. Evening frequency will improve from every 30 minutes to every 20 minutes.